Peter: Peter was the first out of the limo, and I love him with Rachel. They had a very easygoing laidback date, which allowed them to connect well. It also helped to have her dog come to the date. I can tell that Rachel is really into Peter because she seemed to get all giddy when she learned what they had in common. I really like these two together, but I hope they can keep the momentum since he was the very first date. Dean: Dean had a rough start, but he’s recovered well. I love how shy and grounded he seems when he talks to Rachel, and it was adorable how nervous he was to kiss her. He’s a bit young, but I think he’s going far. Bryan: Bryan made Rachel feel better by giving her a massage. I liked that he said he was going to be her own stress relief. It was a great move. Rachel reassuring him shows he’s probably going far. Eric: Eric is still the dark horse in my mind. His presence was known in this episode, although he did dance for like five minutes on the court and then completely missed. Josiah: Now that Dimario is gone, Josiah is the confident one. He said he’s very protective over Rachel, and she’s eating it up. Josiah is a question mark for me because I’m not sure how far he’ll go but Rachel took a liking to him in this episode. Another big reason I love the conversation between Rachel and Peter is because they’re normalizing the idea of seeing a therapist. It’s OK to see someone, and it shouldn’t be something anyone should feel ashamed of. I cannot believe Mila and Ashton came on the show. They’re way too famous and awesome to be on this reality show, but they were great. I love when Mila fell to the ground laughing during their game, and when Ashton was so confused by Lucas. They were so funny and made the date way more memorable. I really wanted Rachel to send the first batch of guys home on the group date. That would’ve made her the ultimate queen, but Dean saved the first group date. Rachel was rocking her purple dresses in this episode. Adam was so funny bringing in a dollhouse in this episode. Did anyone else catch that? The Dimario confrontation was so funny. He actually pretended he didn’t know her. He looked so bad. He should’ve just owned up to the situation instead of just making it worse by lying. 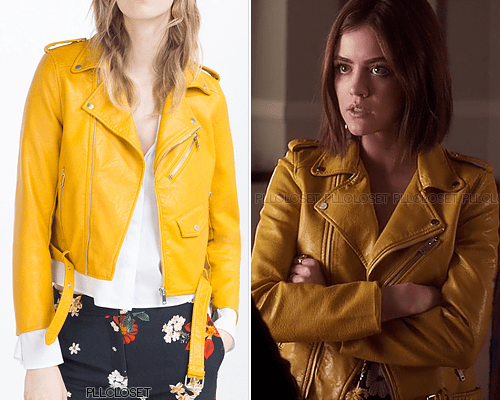 I loved Aria’s leather jacket in this bright mustard color. It’s a great color on a classic cut for a leather jacket. I’m loving her style so much after the time jump because we get these more tailored pieces in a fun modern way. Hanna looked amazing in the red cutout dress. It fit like a glove. The red lip and tousled waves worked so well. She clearly wanted to go back to the start with Jordan. This was an interesting sweater. I liked the fringe and the understated shimmer throughout. If you look at the whole sweater, it has a lot going on for a boho feel, but I also bet it’s super comfy. I love this Sandro top because the print is so retro and fun. 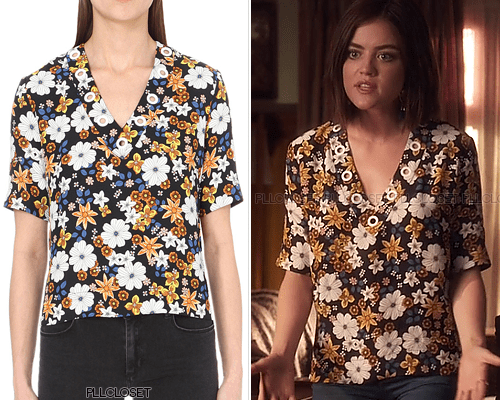 I would expect Spencer to wear this top, but I liked this for Aria too. 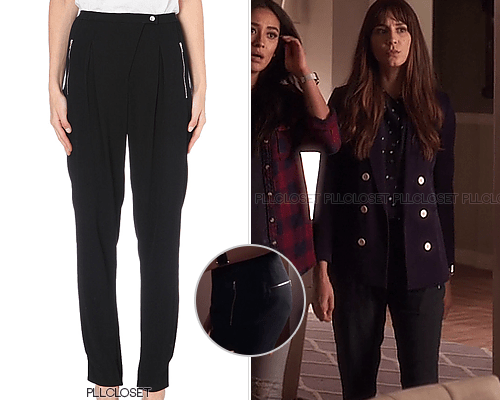 This wasn’t a flashy piece from the episode, but I like how versatile these straight leg pants are. 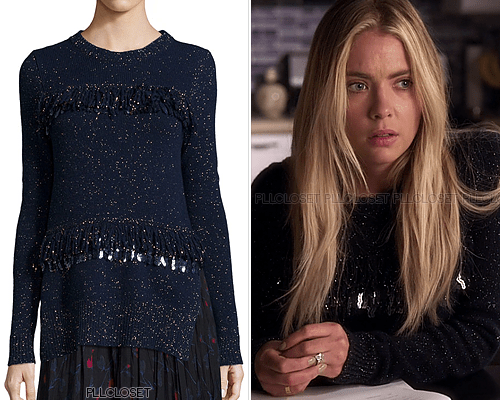 Spencer makes it her own by pairing it with a printed blouse and a classic navy blazer. Here are my thoughts on each designer and I put my favorites on the top and my least favorites in descending order. Edmond– As a huge Survivor fan, I appreciated Edmond’s strategy in the episode. He wants everyone to think he has no idea what he’s doing, and he’s clearly a fan of the show. He was the only designer to have inspiration from an actual card by thinking of a special moment like a wedding. 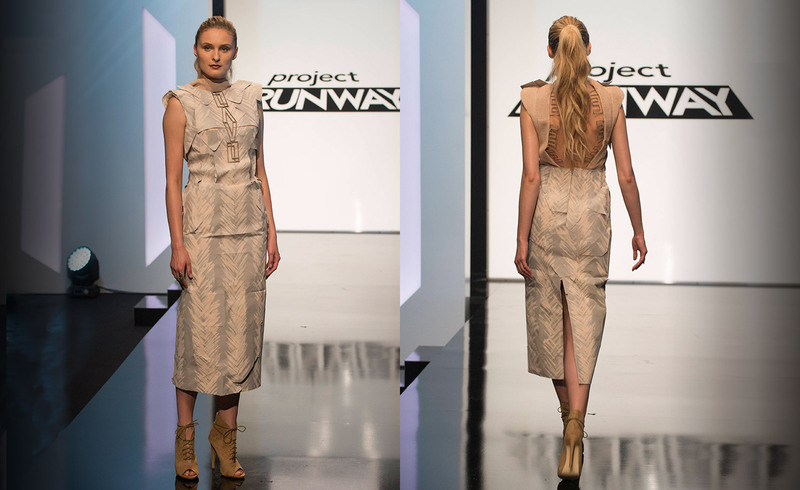 Edmond managed to make a sleek, form fitting top that was made beautifully, and a whimsical tiered bodice. I loved it. Swapnil– He surprised us with a fun dress. It’s very wearable, and I loved the amount of detail placed into this dress. 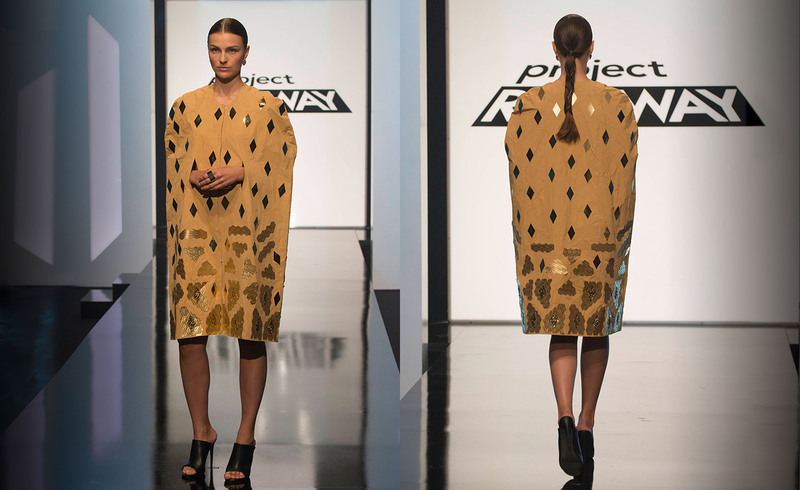 I love that he used a simple silhouette and focused on the texture of the dress. My only thing is that I didn’t love the buttons on the top or the boots. But overall, this was a great dress. David– I honestly can’t believe David went home. He has such a great design aesthetic, and this coat was so fashionable. I want this coat. It’s so shocking and interesting, but still wearable. Sure, he didn’t follow the rules, but there were some much tackier designs. I think he should’ve been in the safe group, and Heidi could’ve just warned him that he shouldn’t have broken the rules similar to Ashley. He should be on All Stars, because this was a huge mistake. Also, why did Tim tell him to start over? His crop top was interesting, and sporty. 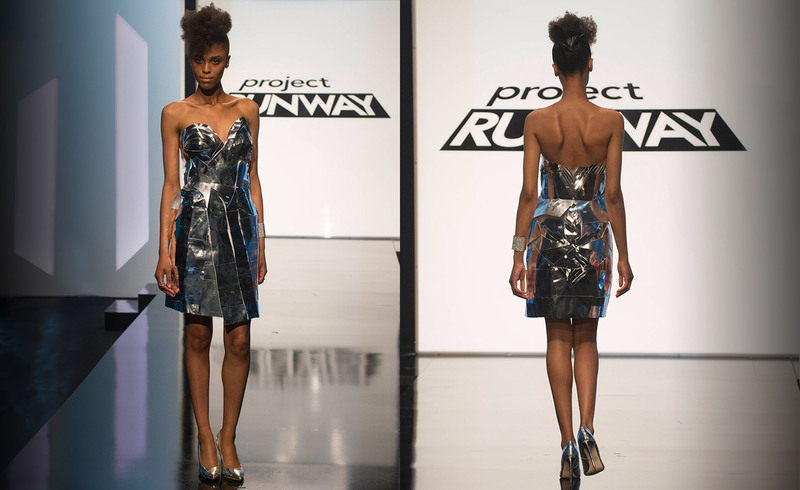 Candice– I think this was slightly better than Blake’s dress, because it really did look like metal and not cards. Blake– The judges said it best. It’s a New Year’s dress. And it did look fabulous. Kelly– This isn’t my personal taste in fashion, but I thought this was a well-constructed look. I don’t really like the hood and the cut of the crop top, but the fringe was a great idea, and the crop top was pieced well. Jake– This was another sparkly dress, and it was fine. It was nothing special, but it was definitely solid. I would just take the straps off. It should be strapless. Hanmiao– This was such a quirky look, and I thought it would be lower on my list, but it was well-made so she’s higher on my rankings. The letter was a fun idea, but it was still stiff and boxy. Laurie– Laurie’s was also in the middle of the road. I like it, but I still felt underwhelmed by it. I liked the gold though. Gabrielle– In the workroom, it looked really cool, and I thought she was only doing red on the shoulder with an ombre effect. Instead, it just fell flat for me, and the back is not good. Ashley– I liked the idea for the design. A poncho is a cute idea. But she broke the rules, and the arms were awkwardly placed. Amanda– I agree with Amanda that this should’ve been safe. The skirt is really bad, and I agreed that the length looks unfinished, but the top was so cute, and I loved the back too. Joseph- This should have been in the bottom. Similar to Amanda’s, the skirt is terrible but the top is cute. However, at least Amanda had some sort of design to the top half. This was so boxy and unwearable. Merline– This was so weird, and poorly made. I hated the gray parts of the skirt. I can’t believe this wasn’t in the bottom too. 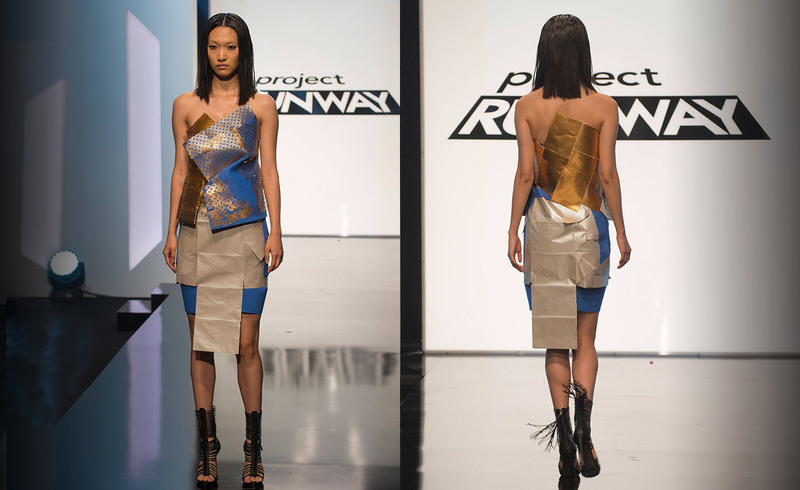 Lindsey– I liked the idea of this, but it wasn’t made well, and ended up looking like wallpaper instead of fabric. Those are my thoughts on the designers! Tune in next week for episode 3.